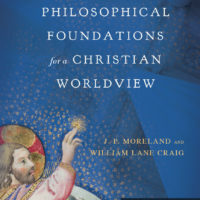 by Dr. J. P. Moreland and Dr. William Lane Craig (two of the most respected leaders in Christian apologetics), is an epic work! They feel it is beyond their comprehension. They believe it to be bad. On the first point, that is often the case. Philosophers are known for taking difficult concepts, and making them even more difficult to understand. On the second, if we consider the etymology of the word, Philosophy, we will see that it is the combination of two Greek words: philo (meaning “love”) and sophia (meaning “wisdom”). We are commanded in Scripture to “love wisdom” (Prov. 4:6), so in that sense, we all should “do” philosophy. There are many sub-categories under each. The material is presented at a college level, and unless you are especially interested in this topic, this is not a book that you will choose to curl up with at night. But it is an amazing reference tool, and pastors, counselors, Christian leaders, and serious scholars will definitely want to add this resource to their study collection. Did I mention it is almost 700 pages?!! This is the most comprehensive book I have seen to-date on this important topic. This new second edition is case-bound and was released in October 2017, by InterVarsity Press. Thanks Wayne…and your review is spot on. The original is extraordinary reference. Now…that said, is the difference between the original and the new edition substantial enough to have both? Thank you Sir…and may God continue to bless and keep you.